Well, unfortunately my wrist surgery didn't go quite as planned. Instead of an easy arthroscopic surgery with very little recovery, I ended up having full-blown surgery with a metal hook implanted in my bone. 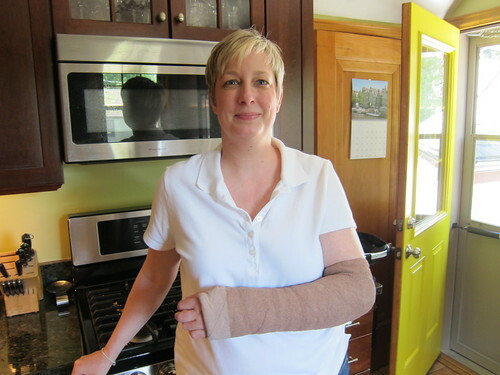 Now I am in a cast that goes up past my elbow. Needless to say, my cooking endeavors are even more restricted (as are my typing since I only have one hand). So, Matt continues to be in-charge of meals for at least the next six weeks. Luckily, he enjoys being creative especially when it involves grilling. Last night's dinner was no exception. He'd picked up some chicken thighs and originally just planned to season them a little, but walking by the olive bar at the grocery store, he had another idea. Why not use olives to season the chicken? This was such a simple dish to make with very few ingredients. The result tasted like something with a lot more effort behind it. The olives and feta cook under the chicken skin adding both flavor and garnish to the finished dish. 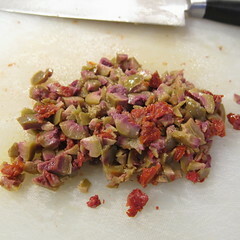 A note on the olives: We used large green martini olives stuffed with sun-dried tomatoes. You can use any flavor or style of olive you like. Mix the olives and feta together (chop the feta smaller if it's too big). 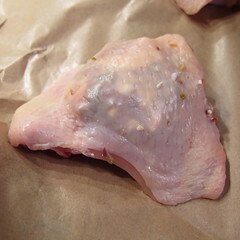 Gently pull the skin away from the thighs to create a pocket. 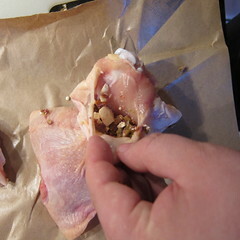 Divide the olive feta mixture into four and stuff it under the chicken skin. Brush the skin with a little olive oil. Place the thighs on the grill skin side down and cook for 2 minutes. Flip over and continue cooking until done, 6 - 8 minutes more should do. 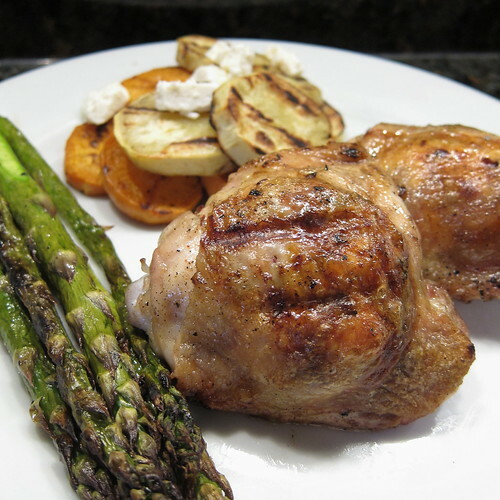 Matt served the chicken with two very easy grilled sides, sweet potatoes and asparagus. The sweet potato was so good done on the grill. Matt just peeled, sliced and microwaved them until tender. Brushed with olive oil, they were finished on the grill and topped with a little crumbled feta. Salty, sweet and really perfect with the feta in the chicken. This looks delicious! Sorry to hear about the on-going issues with your wrist. You're so lucky to have Matt in your life. If I couldn't cook, my choices would come down to delivery of pizzas and tortas. hehe. Get well soon! Oh goodness! I'm so sorry this is worse than expected - and so very happy you have Matt :) I've missed everyone and can't wait to catch up! Olives and feta? Count me in! Hope you have a speedy recovery! Yee-ouch! Hope it mends quickly. But in the meantime, I will be enjoying this tasty idea of yours. So easy! boo! hope you're handling the news and the cast as well as can be expected! Oh no! I'm so sorry to hear that. I hope that you heal quickly. I guess all you can do is just try to enjoy the cooking and typing break as much as possible. I bet you feel fortunate that Matt is an awesome cook. No microwave dinners for you. Ha, ha! This chicken looks great! Get well soon! Well that just stinks! I hope you heal well and quickly! Have chicken thawed, have olives...and goat cheese. I think this will tomorrow's dinner. So sorry about your hand surgery. I hope all is going well in your recovery, Like you said, in the mean time Matt is taking care of you. Very nice. Love this simple yet flavorful dish. Hope you heal quickly. A cast is no fun. I love olives and feta. This chicken sounds delicious! Such a great combination of flavors! Delicious!